It might just be that Penny Caldwell is the world’s foremost expert on the cottage. As the editor of this magazine from 2000 to 2015, she spoke to hundreds (thousands?) 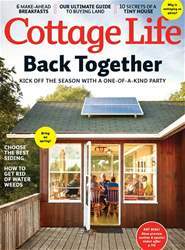 of experts and cottagers and heard about—and solved—pretty much every cottage problem there is. Starting with this issue, Penny will share that expertise with readers in her new column, The Fine Print (p. 50). She will do the homework needed to tackle a specific task so that you don’t have to spend hours online doing it yourself. First up: Penny investigates the ins and outs of removing aquatic vegetation from your lake.